Awesome Comforter set with the pillows. Transform your bedroom into the elegant, inviting space you've always dreamed of with this pristine comforter set. The luxurious design and rich, refined color scheme is reminiscent of palatial spaces, elevating any space into a lavish retreat. Embroidery details and pops of gold will make you feel like the royalty you are. Very nice comforter. Great quality! Nice color. Matches description of colors. Is undersized a bit. Luckily I read other reviews about the size and bought a king for a queen bed and it fits perfectly. If you don't have a footboard, you might not like that it does not completely cover the mattress at the foot of the bed,if you have a pillow top which most of us do now so we have issues with that. If you have a footboard that you cant see thru, it doesn't matter as you wont be able to tell. I do not think the comforter companies are taking that into consideration so usually I have slim pickings when shopping for them. I don't like any of the pillows colors and usually are quite cheap looking. I wish they didn't include them. its a waste of money. just really wanted the comforter, 2 shams and bedskirt. the pillows sit around the bag until I resell my comforter with the complete set and I don't have much room with a 1 bedroom apt and NO OUTSIDE STORAGE. Ugh. The bedskirt is think an bit flimsy but doesn't get touched much so its ok. Yes I recommend the comforter and shams are great. Not too hot or cold. I like it a lot. Price could be a bit cheaper and lose the pillows!! 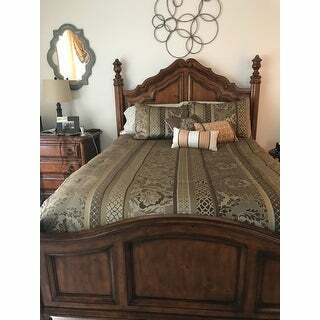 Madison Park Venetian Brown 7 Piece Jacquard Comforter Set is a good buy. I wish that the bed sheets were apart of the set. The comforter fits great and matches my bed sheets but I would have preferred it with the comforter set. Loved this bedding but the colors were not what I needed. This set is all browns and has gold accents. It is a very nice comforter and the pillows make it easy to decorate. We are going to paint an accent wall. Yeah! This is a very nice comfortable and the colors are definitely as pictured. If you are like me and enjoy a heavy comforter to snuggle under, then this is for you. It definitely has some weight on it, but i love! 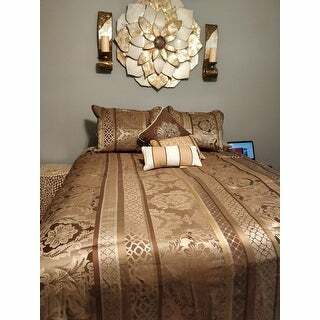 Love the colors and the fabric but the comforter is too small for a king size bed. I ended up purchasing the spread by the same company. This comforter was made terribly. Top material lifted away from bottom of comforter so it was always loose and always looked wrinkled. Do not purchase this item! The color was a little dark for my room. Comforters are always nicely made from Madison Park. Kept it. "Would you get window treatments for this set"
"Can I get matching bedroom drapes with the comforter set?" Unfortunately, we do not currently carry the matching curtains.